As we have not detailed the “heavies” often enough within the summaries, let us take those first two lines as license to formally discuss the 1st Indiana Heavy. The “Jackass Regiment” mustered as the 21st Indiana Infantry in July 1861. Assigned to the defenses of Baltimore, the regiment was among those sent on the New Orleans Expedition at the start of 1862. In February 1863, the regiment was re-designated heavy artillery in light of its posting to fortifications around Louisiana. Colonel John Keith Commanded the regiment. Eight companies of the regiment served in the siege of Port Hudson. With the fall of that river bastion, the regiment’s batteries were assigned to different posts in the Department of the Gulf. Company A: No return. Captain Eden H. Fisher remained in command, but resigned in November. Captain Harvey B. Hall was the replacement. The battery was likely at Baton Rouge at the end of September. Company B: No return. Garrison artillery at New Orleans. Captain James Grimsley commanded. Company C: No return. Captain Elihu E. Rose in command. Company D: No return. Captain William S. Hinkle’s command. Company E: No location given, but with four 20-pdr Parrotts. Captain James W. Hamrick in command. Company F: No return. Captain Francis W. Noblet’s battery. Company G: No return. Garrison artillery at New Orleans. Captain Edward McLaflin was in command, but was absent from the battery, commanding a detachment from the regiment at Baton Rouge. Company H: No return. Captain James W. Connelly in command. Company I: No return. Captain Richard Campbell’s command. Company K: No return. Garrison artillery at New Orleans. Under Captain Clayton Cox. Company L: Reporting at New Orleans, Louisiana with three 12-pdr Napoleons and two 20-pdr Parrotts. Captain Isaac C. Hendricks commanded. The battery was assigned to an ad-hoc command under Major-General Cadwallader Washburn assembling at New Orleans that fall. Company M: No return. Garrison artillery at New Orleans. This battery mustered in the early fall. Captain Samuel A. Strong was in command. I believe many of those for which a location is not indicated were at the time part of the detachment of the regiment at Baton Rouge. Furthermore, I’d point out that several of these batteries would support the Red River Campaign in 1864, hauling 20-pdr and 30-pdr Parrotts along. 1st Indiana Cavalry: Artillery stores. At Pine Bluff, Arkansas with three 10-pdr Parrotts. As mentioned for the previous quarter, the detachment of this regiment then serving in Arkansas had a three gun section under Lieutenant Samuel Lefler, Company B. The section fought well in an action at Pine Bluff on October 25, that fall. 6th Indiana Cavalry: A lieutenant-colonel reporting artillery stores. No location given. Two 12-pdr mountain howitzers. Lieutenant-Colonel Courtland C. Matson and six companies of this regiment were assigned garrison duties in eastern Kentucky at this time of the war, and part of the Twenty-Third Corps. The regiment, which was formed from the 71st Infantry in 1862 and reorganized as cavalry in the winter of 1863, arrived in Kentucky in August. 87th Indiana Infantry: A lieutenant-colonel reporting artillery stores. At Vicksburg, Mississippi with one 6-pdr field gun. The only lieutenant-colonel in the regiment at the time as Thomas Sumner. The 87th was assigned to Third Brigade, Third Division, Fourteenth Corps. And from that we have to ask about the location given here, as that formation (and the regiment indicated) was at this time in Chattanooga. 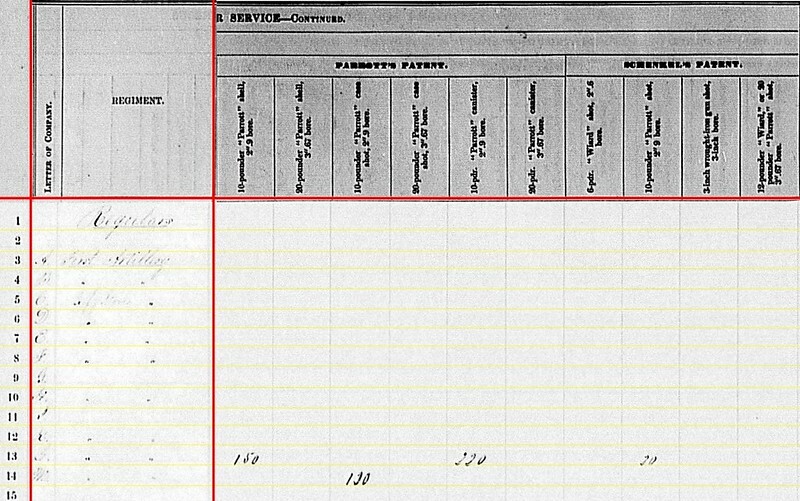 And if we look at the reporting date – June 24, 1864 – we know the 87th was taking in Kennesaw Mountain at that time. So this entry is questionable from left to right. 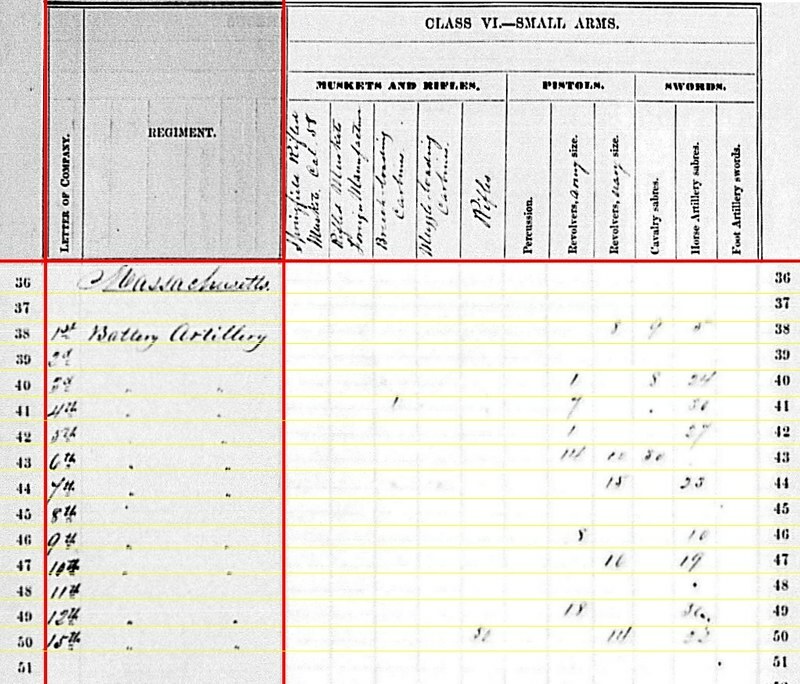 But the handwriting is clear – 87th Infantry and Vicksburg! One or the other has to be incorrect. Company L, 1st Heavy: 121 shot, 62 shell, 196 case, and 53 canister for 12-pdr Napoleon. 6th Cavalry: 128 case and 124 canister for 12-pdr mountain howitzers. 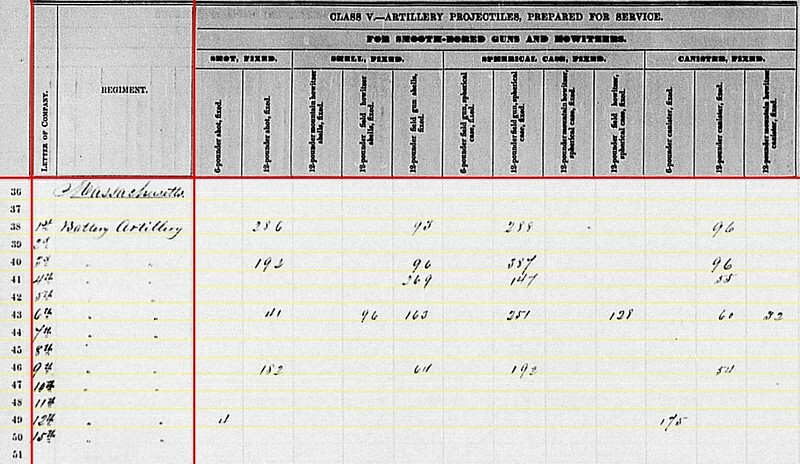 87th Infantry: 23 shot, 48 case, and 40 canister for a 6-pdr field gun. Company E, 1st Heavy: 210 shell for 20-pdr Parrott. Company L, 1st Heavy: 30 shot, 195 shell, and 34 canister for 20-pdr Parrott. 1st Cavalry: 78 shell and 123 canister for 10-pdr Parrott. Company L, 1st Heavy: 50 rifles (type unspecified) and six horse artillery sabers. 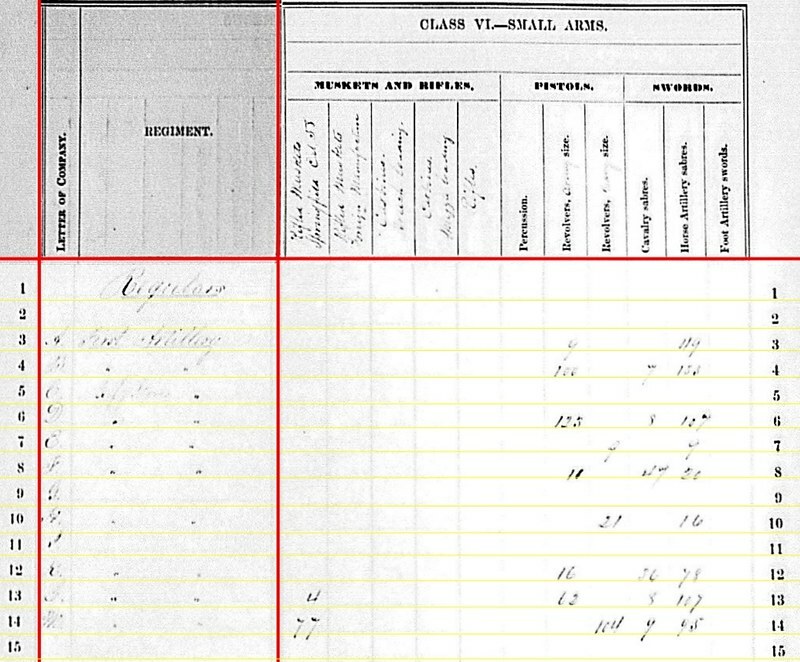 So we close out the third quarter, 1863 summary for Indiana’s artillery with a very difficult question, about that entry for the 87th Indiana Infantry, marring an otherwise relatively clear set of entries. I wish there were answers! Wilder’s Battery (26th Battery): At Somerset, Kentucky with six 3-inch Ordnance Rifles. Lieutenant Casper W. McLaughlin was in command, with battery assigned to Second Brigade, First Division, Twenty-third Corps. 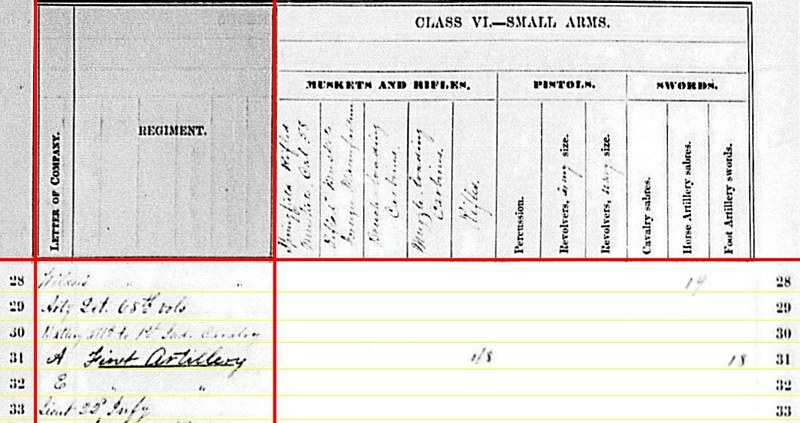 A Department of the Ohio artillery report, dated June 30, 1863, indicated the battery had six 3-inch steel rifles. However, as we have often seen, the description of wrought iron guns was often imprecise, from a metallurgical standpoint. “Arty Det. 65th Vols“- or 65th Indiana Infantry (mounted): First the listed particulars – this detachment reported from Raleigh, North Carolina with one 12-pdr field howitzer and three 3-inch Ordnance rifles. 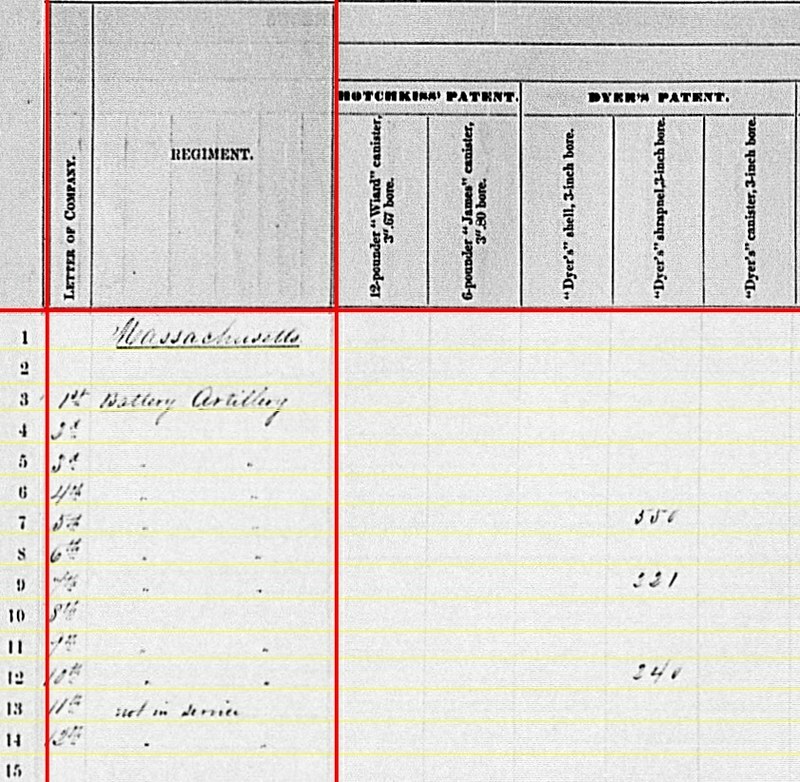 The location most likely reflects the date of report receipt in Washington – May 6, 1865. And in June 1863, the 65th Indiana had many, many miles to travel before reaching Raleigh. Backing up to that spring, the regiment was mounted, and assigned to the Second Division, Twenty-third Corps, then serving in Kentucky. Other than that, I don’t have details of the artillery detachment. Battery A, 1st Indiana Heavy Artillery: At Port Hudson, Louisiana with four 20-pdr Parrotts. Part of the siege operations at that place, and assigned to the First Division, Nineteenth Corps. Captain Eden H. Fisher was in command. Interesting to note the clerks rated this battery as “field” and those 20-pdr Parrotts as field guns, despite the battery’s tactical role as siege artillery. Battery E, 1st Indiana Heavy Artillery: Reporting from Baton Rouge, Louisiana, with four 20-pdr Parrotts. Part of the garrison then at the state capital, and part of the Nineteenth Corps. Captain James W. Hamrick was in command at this time, according to the State Adjutant’s report. As with the sister battery, it is worth noting the clerks rated this garrison battery as a field battery, with its Parrotts. “Lieut. 35 Infy“: Reporting at Nashville, Tennessee with three 6-pdr field guns. The 35th Indiana Infantry was at that time assigned to the Third Brigade, Third Division, Twenty-first Corps. Recruited as an Irish regiment, the unit was under Major John P. Dufficy at this juncture of the war. But why those Irish infantrymen were assigned three cannon is unknown to me. 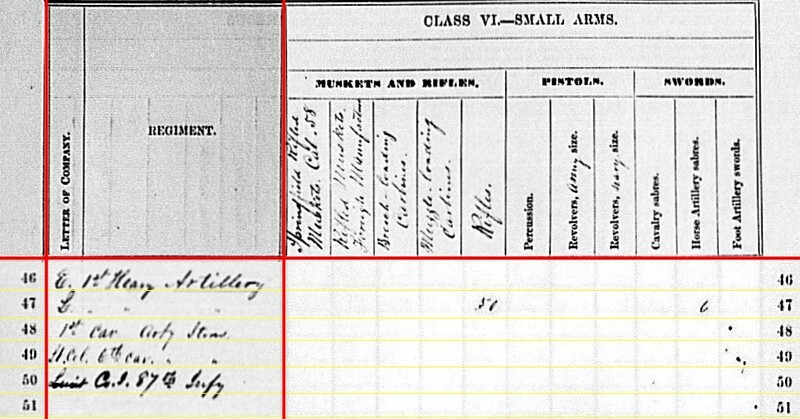 No reports link these guns with the regiment (or higher units) during winter months at Murfreesboro or the Tullahoma Campaign. The receipt date of this return was in 1865. After the Atlanta Campaign, the regiment was among those sent to middle Tennessee, and fought there in the battles of late 1864. So the unit has several periods of service in and around Nashville which this return might match with. 65th Infantry Detachment: 250 shell, 20 case, and 470 canister for 12-pdr field howitzers; and also 48 canister for 6-pdr field guns. 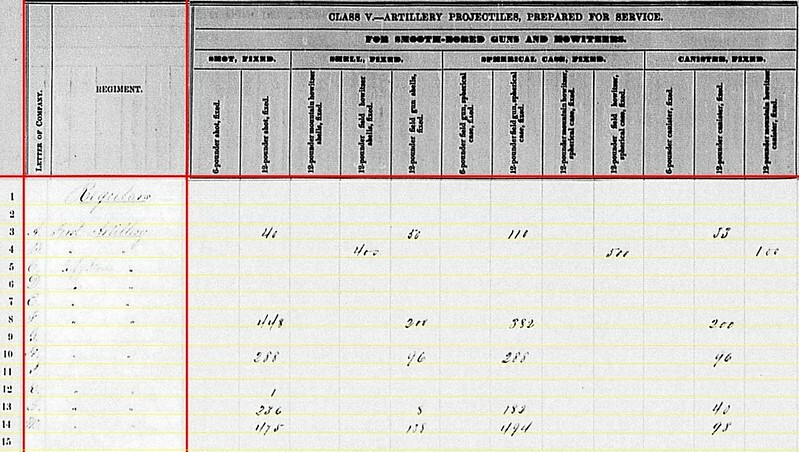 35th Infantry Detachment: 28 shot and 4 case for 6-pdr field guns. Perhaps it would have been nice for the 65th Infantry to send over that canister to the 35th? Two batteries reported 3-inch rifles on hand. But how about that third entry line? Wilder’s Battery: 600 canister, 174 percussion shell, 350 fuse shell, and 426 bullet shell for 3-inch rifles. 65th Infantry Detachment: 140 canister and 150 percussion shell for 3-inch rifles. Battery A, 1st Heavy: 439 fuse shell in 3.67-inch rifle caliber. And that corresponds to the bore of a 20-pdr Parrott. Interesting entry, as we more often see Hotchkiss of this caliber issued to James Rifles. And, as seen from the column header, the Ordnance Department considered it a “Wiard” caliber. Sort of hitting all the spots there. 1st Cavalry Detachment: 60 shell and 20 canister for 10-pdr Parrott. Battery A, 1st Heavy: 250 shell for 20-pdr Parrott. Battery E, 1st Heavy: 260 shell and 8 canister for 20-pdr Parrott. Battery A, 1st Heavy: 40 shot for 20-pdr Parrott. Battery E, 1st Heavy: 16 shot for 20-pdr Parrott. Wilder’s Battery: Nineteen horse artillery sabers. Battery A, First Heavy: Forty-eight rifles and eighteen foot artillery swords. I am certain there are lots of “back stories” within the unanswered questions surrounding these six lines. If any readers have leads, I would greatly appreciate a comment here. 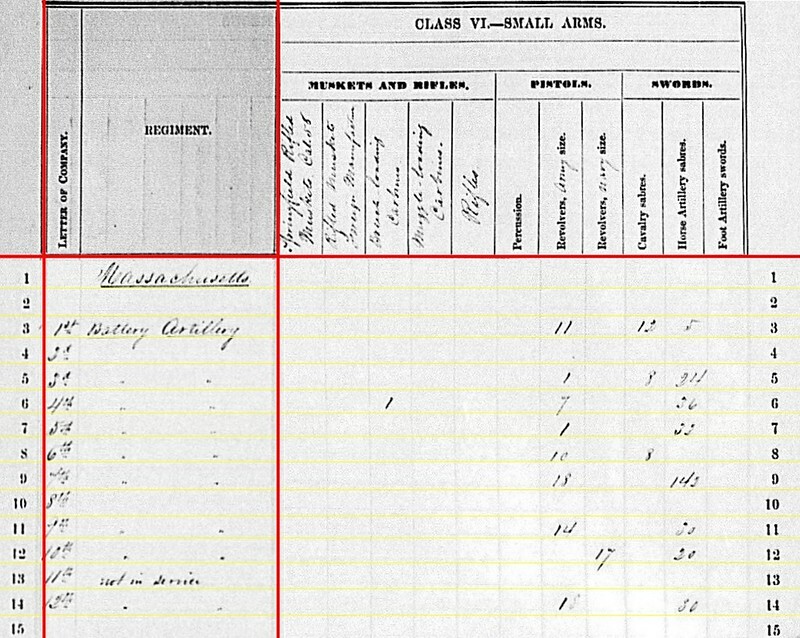 Battery A – Reporting at Port Hudson, Louisiana with four 12-pdr Napoleons and two 3-inch rifles. A location change from the previous quarter, but their charges remained the same. Captain Edmund C. Bainbridge remained in command of this battery, assigned to First Division, Nineteenth Corps. Of note, Bainbridge also served as the division’s artillery chief. 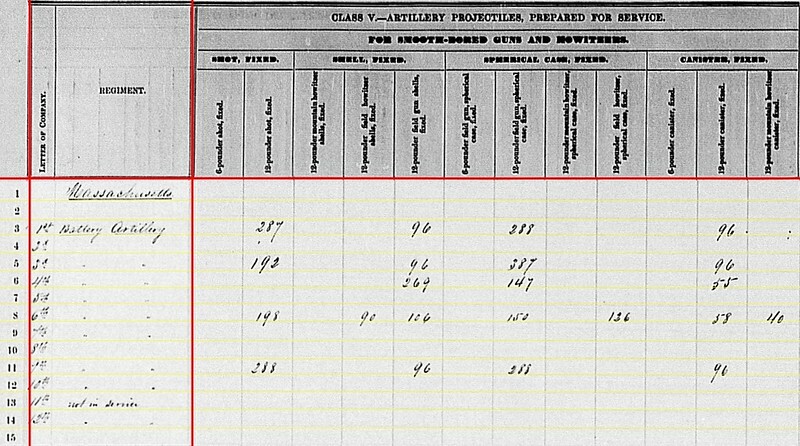 Battery B – At Hilton Head, South Carolina with four 12-pdr field howitzers, and adding two 3-inch rifles (over the previous quarter’s report). Lieutenant Guy V. Henry commanded this battery, assigned to Tenth Corps. Henry temporarily served as the Chief of Artillery, Department of the South, from around June 19 through the first week of July. But no “fill in” battery commander is indicated on the records. Battery C – At Fort Macon, North Carolina with a dim annotation I interpret as “inf’y service”. However, the line does not tell the whole story. A detachment from Battery C, under Lieutenant James E. Wilson, served in the Tenth Corps, and would be active in South Carolina. Battery D – No change from the previous quarter. At Beaufort, South Carolina with four 3-inch rifles. Lieutenant John S. Gibbs assumed command of the battery. Though co-located with Battery M, the two were officially listed separately in organizational returns. 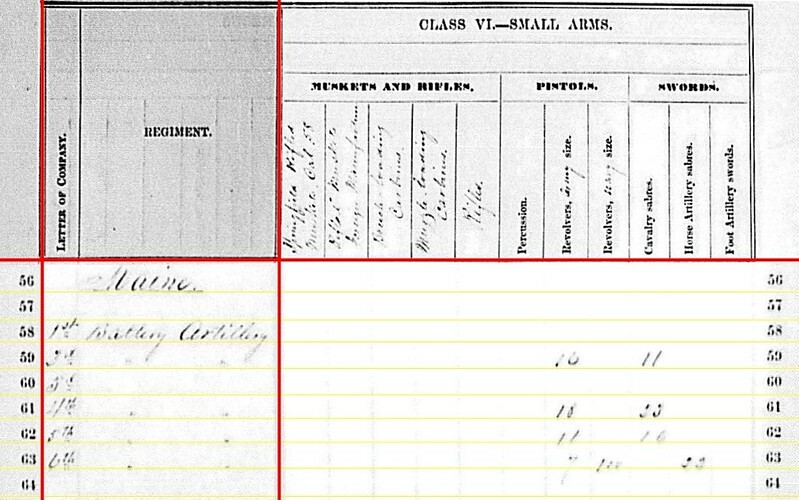 Battery E – Reporting at, if I am reading this right, Manchester, Pennsylvania with four 3-inch rifles. 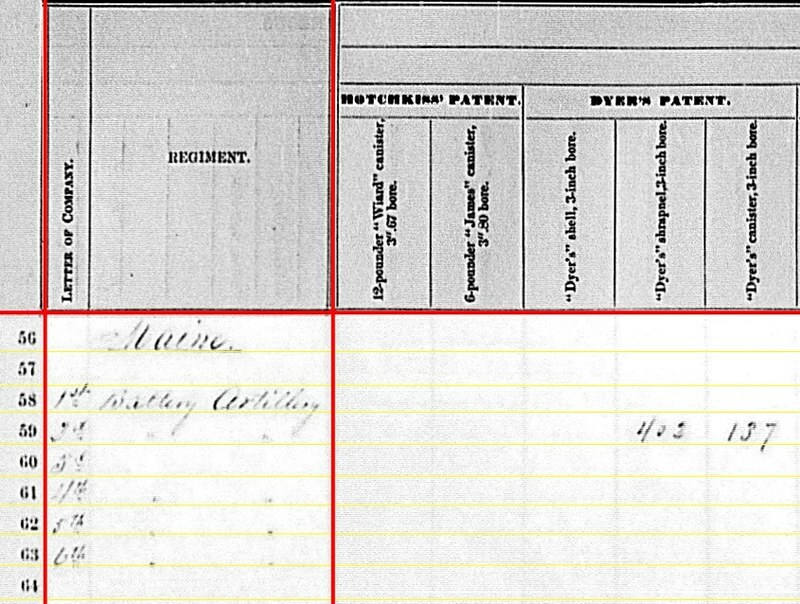 If my read of the location column is correct, this is an excellent “snapshot in time” of a battery on campaign… at least for the location column, keeping in mind the return was not received until August 11, 1863. Of course, Captain Alanson Randol was in command of this battery, which was merged with Battery G (below), as part of the 2nd Brigade of Horse Artillery, Cavalry Corps, Army of the Potomac. Battery F – Port Hudson, Louisiana with six 12-pdr Napoleons. Under Captain Richard C. Duryea, this battery served Third Division, Nineteenth Corps. Duryea is also listed as commanding the division’s artillery at this time. Battery H – At Warrenton, Virginia with six 12-pdr Napoleons. The location is an obvious error. The battery had moved from Third Corps to the Artillery Reserve after Chancellorsville. So the location might more accurately be Frederick, Maryland. Captain Chandler P. Eakin commanded the battery. Though just two days into the next quarter he was severely wounded, with Lieutenant Philip D. Mason assuming the role. Battery I – No return. But we are familiar with Lieutenant George Woodruff’s battery, which brought six 12-pdr Napoleons into action at Gettysburg. They were assigned to Second Corps. Battery K – Another difficult to read location entry. I cannot make out the town, but the state is “MD”. So we might also presume this to be a report reflecting an “on campaign” position, as of June 30. The battery reported six 3-inch Ordnance rifles. -Also with 2nd Brigade of the Horse Artillery, supporting the Cavalry Corps, Captain William Graham was the commander. Battery L – Reporting at Port Hudson, Louisiana with four 12-pdr Napoleons and two 10-pdr Parrotts. Captain Henry W. Closson’s battery was in Forth Division, Nineteenth Corps. Battery M – At Beaufort, South Carolina with four 12-pdr Napoleons (losing two 3-inch Ordnance rifles from the previous quarter). Captain Loomis L. Langdon lead this battery, assigned to the Tenth Corps. The preponderance of entries were for 12-pdr Napoleon rounds. Battery A: 40 shot, 56 shell, 110 case, and 33 canister for 12-pdr Napoleon. Battery B: 400 shell, 500 case, and 100 canister for 12-pdr field howitzer. Battery F: 448 shot, 300 shell, 382 case, and 200 canister for 12-pdr Napoleon. Battery H: 288 shot, 96 shell, 288 case, and 96 canister for 12-pdr Napoleon. Battery K: One (1) shot for 12-pdr Napoleon. As this battery had only 3-inch rifles, we have to ask if this is just a stray mark… or the battery lugged around a single Napoleon shot for… perhaps… bowling? Battery L: 236 shot, 8 shell, 182 case, and 40 canister for 12-pdr Napoleon. Battery M: 475 shot, 138 shell, 494 case, and 96 canister for 12-pdr Napoleon. Aside from the question about Battery K, there is also a question about some reported quantities. As related in the preface to this quarter, we have to ask for the batteries in action at Gettysburg if these are quantities on hand June 30? Or for some other point after the battle? And I would submit that question need be assess on a battery-by-battery basis. Battery B: 280 canister, 422 percussion shell, 227 fuse shell, and 275 bullet shell for 3-inch rifles. Battery D: 86 canister, 50 percussion shell, 176 fuse shell, and 150(?) bullet shell for 3-inch rifles. Battery E: 60 canister, 180 percussion shell, and 360 bullet shells for 3-inch rifles. Battery K: 60-canister and 56 bullet shells for 3-inch rifles. Battery M: 12 canister, 12 percussion shell, 24 fuse shell, and 20 bullet shells for 3-inch rifles. First off, Battery M must have retained a small quantity of rounds on hand after transferring it’s 3-inch rifles to another battery. The other question that springs to mind is regarding the low numbers reported for some batteries, such as Battery K. We might speculate if that reflects the quantity on hand after a battle or major campaign. But that’s speculation. Battery L: 150 shell and 220 canister for 10-pdr Parrott. Battery M: 130 case for 10-pdr Parrott. Once again, we find Battery M with ammunition that will not fit its guns. Battery L: 20 shot for 10-pdr Parrott. Battery B: 100 shells for 3-inch rifles. Battery K: 127 shells for 3-inch rifles. This explains some of the shortages noted on the Hotchkiss page. But we see batteries mixing the two types of projectiles, against the better wishes of General Hunt. Battery A: Nine Army revolvers and 119 horse artillery sabers. Battery B: One-hundred Army revolvers, seven cavalry sabers, and 153(?) horse artillery sabers. Battery D: 123 Army revolvers, eight cavalry sabers, and 107 horse artillery sabers. Battery E: Nine Navy revolvers and nine horse artillery sabers. Battery F: Ten Army revolvers, forty-seven cavalry sabers, and twenty horse artillery sabers. Battery H: Twenty-one Navy revolvers and sixteen horse artillery sabers. Battery K: Sixteen Army revolvers, thirty-six cavalry sabers, and seventy-eight horse artillery sabers. Battery L: Four Springfield .58 caliber muskets, sixty-two Army revolvers, eight cavalry sabers, and 107 horse artillery sabers. Battery M: Seventy-seven Springfield .58 caliber muskets, 104 Navy revolvers, nine cavalry sabers, and ninety-five horse artillery sabers. We’ve discussed in earlier posts the peculiarities of small arms issue to field artillery batteries. Service in the Department of the South, were batteries were detailed to perform many non-artillery tasks, was one factor here. Still, the batteries of the 1st US Regiment would seem to be armed to the teeth!